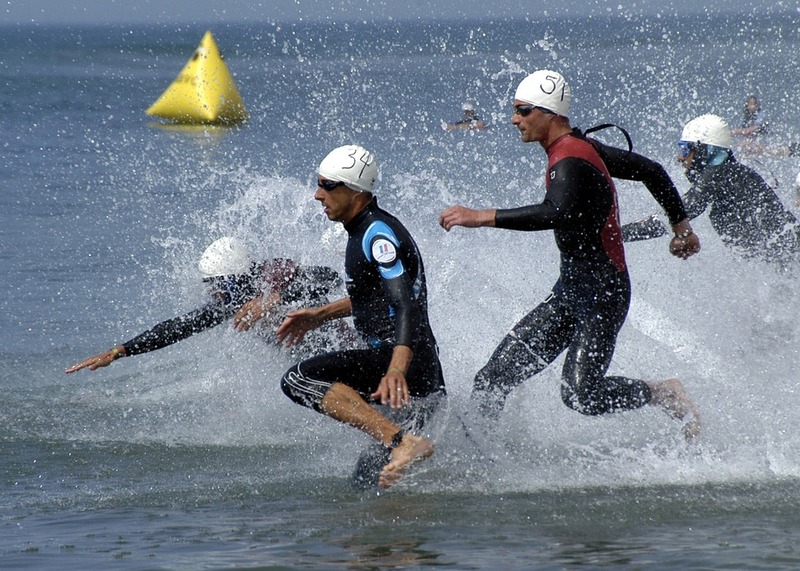 If you're thinking about entering your first triathlon, you need to be well-prepared. A triathlon is no easy feat, after all, it's three disciplines mixed into a single race. Here are some great tips to help you reach that finish line. Training for a race is hard, no matter what type of race it is. Training requires concentration, perseverance, strength, and sacrifices. Now, training for triathlon is three times harder; you have to combine multiple training styles to be able to compete. One can quickly decide to back out of a triathlon when they stop to consider all that it involves, but the feeling of pride and fulfillment knowing you pushed beyond what you believed you could do as an athlete is unbeatable. If you decided to complete your first triathlon, but you don’t know where or how to begin, join Athletic Republic of Orange County in this article about useful tips and tricks to get ready for the big race. A typical triathlon goes like this: one fifth of the race is swimming, 30 percent is running, and the rest is spent cycling. However, not all triathlons are created equal. You’ve got the “Sprint Tri,” the “Olympic Tri,” and the best know one, the Ironman. If this is your first triathlon, you better start with a short race to get your feet wet. Still, you should read a little bit more about the types of triathlons you can participate in before signing up. Triathlons involved a lot of gear. You will need a bike and helmet, cycling and running shoes, and a tri suit. Although, if you wish, you can complete the race with any old gear you have at home, the right equipment does help your performance. Most coaches recommend a triathlon suit so you don’t have to worry about changing attire from one part of the race to the next. You should have your gear ready way before the race so you can train with it and get used to it. Sometimes you need someone who’s been in a triathlon or knows how to prepare for them to guide you. There comes the point when your best isn’t enough, and you need external help to get better. If you struggle with swimming, you need a coach to help you become a more efficient swimmer. A trainer can also teach you how to save your energy during the race. So, if you’re looking for a sports trainer to help you in any area of a triathlon, look no further, just call Athletic Republic of Orange County at (714) 972-2762. They will assist you with all your sports training needs and design the appropriate program. A quality workout doesn’t have to last all day. You don’t need to sacrifice your personal life to prepare for a triathlon. Together with your sports trainer, you can design a good workout plan that meets your time restrictions and helps you achieve your goals. A triathlon gives you a great array of sports training options that adjust to your schedule. It’s natural for an athlete to gravitate to a particular activity in a triathlon. If you’re a runner, running is what you will enjoy training the most. But if you are a great runner and a not a great cyclist, strengthening your running skills won’t make you a better cyclist. You need to work harder on your weaknesses, even if they’re athletic areas you don’t enjoy as much. There’s no way to stress the importance of remaining hydrated while racing and sports training. You’re going to be sweating a lot, and you need to replace those fluids. Look for a drink with electrolytes, vitamins, and sugar to maintain your energy. If you need an extra energy boost, drink a caffeinated drink. You should also practice your ability to hydrate (and eat) while riding a bike. Remember that there are no picnic tables during the race, and all your eating and drinking need to be done in motion. It’s better if you get used to it before the race. If this is your first triathlon, you shouldn’t be comparing yourself to more seasoned athletes. You shouldn’t be copying their training programs or pushing yourself to be just like them. Keep it simple and find a sports training program that works for you. Success comes from being prepared and feeling confident with what you can do. Not only do you need to prepare your body for the race, but you also need to prepare your mind. Sports training for a triathlon can be very mentally draining. Find your true motivation and don’t let it slip since this is what will get you to the finish line. Triathlons require athletic abilities that you can improve with the correct sports training program. Athletic Republic of Orange County has a great team of qualified trainers that can help you achieve your sports training goals. Whether you are preparing for a marathon or getting ready to take the plunge and go for your first triathlon, you will need an expert's help. You can call Athletic Republic of Orange County at (714) 972-2762 and schedule a free session so you can start your training soon.